The importance of Eucharistic Adoration is shown in the fact that the Church has a ritual that regulates it: the Rite of Eucharistic Exposition and Benediction. This is an extension of the adoration of the Blessed Sacrament which occurs in every Mass: "Behold the Lamb of God, behold him who takes away the sins of the world. Blessed are those called to the supper of the Lamb." Exposition of the Blessed Sacrament flows from the sacrifice of the Mass and serves to deepen our hunger for Communion with Christ and the rest of the Church. The Rite concludes with the ordained minister blessing the faithful with the Blessed Sacrament. Some important prayers that are used during this rite include the Anima Christi (en español) and the Tantum Ergo. 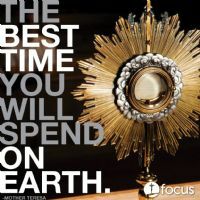 Holy hours are the Roman Catholic devotional tradition of spending an hour in Eucharistic Adoration in the presence of the Blessed Sacrament. The bishops have created a variety of holy hours that focus our prayer to Jesus Christ on peace, life, vocations, and other topics that are at the heart of the life of the Church and the world.